Even in the rain the models in Renoir’s “Boating Party” represent a sunny ideal. Among the many unintended consequences of the government shutdown here in D.C. has been the rise in attendance at the city’s privately run museums. 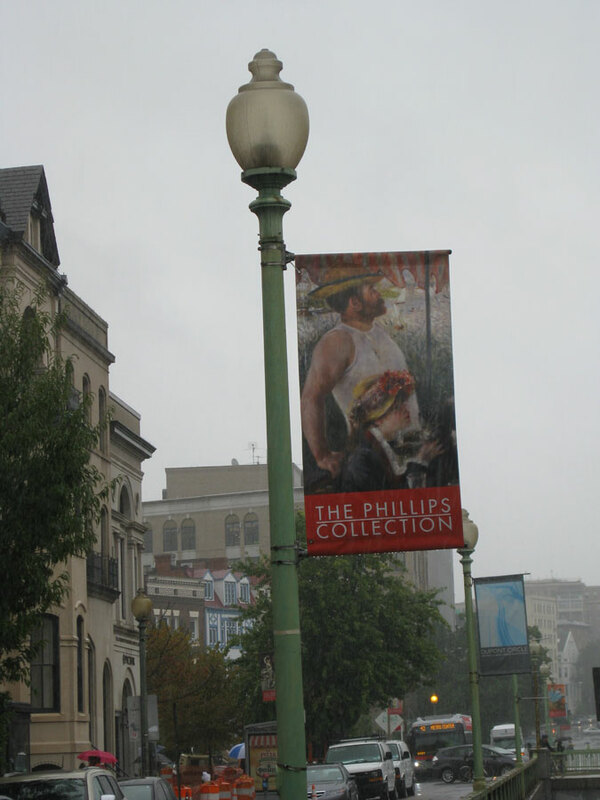 Art lovers looking for somewhere to get their gaze on have been flocking to places like the Corcoran Gallery (which has funding issues of its own), the Textile Museum (soon to be relocated on the GW campus) and the Phillips Collection near Dupont Circle. The Phillips is perhaps the most beloved gallery in town, not least because it’s home to one of the world’s most beloved paintings, Renoir’s joyous celebration of all things French, “Luncheon of the Boating Party.” That this famous and priceless work can be seen in such an intimate and exquisite setting as the Phillips is one of the wonders of living in this Capitol city. So much of D.C.’s tourist zone is writ large, in grand marble monuments and stern statues of famous men. It’s refreshing to step into a place devoted to a more private, personal artistic vision. I’ve taken Renoir’s masterpiece for granted for years, like a beautiful world I can escape into whenever I need a dose of romantic optimism. But I will never look at it in quite the same way again, thanks to author Susan Vreeland, whose historical fiction novel I just finished reading. Vreeland has made a good career out of researching and imagining the stories behind some famous paintings. Her Girl in Hyacinth Blue, based on the painting by Johannes Vermeer, was a bestseller and established Vreeland as a meticulous and gifted storyteller. I never read Girl. In general I’m not a huge fan of historical fiction, which usually feels a bit neither-this-nor-that to me. I like my fiction fictional, all the way through. But I understand how readers who long to know more about beloved artists could be attracted to a fictionalized account. I read Vreeland’s Luncheon of the Boating Party not because I was curious about Renoir, the man. I was curious about the people in the painting. The scene is so relaxed and carefree, the models all look like people who would be fun to hang out with. And this is what makes Vreeland’s Luncheon a success. The story doesn’t simply dwell on the Renoir’s struggle to raise the money to buy his paints and pay for the models and the tremendous amount of food that was consumed during the eight sessions of posing. Nor does it focus entirely on the thematic and philosophic issues that were dividing the up and coming artists of that time in France, when the sense of “la vie moderne” was challenging the old constructs of French society and art. At one point in the novel Renoir says, “I despise the idea that paintings are investments.” I’d be curious to know if this is an actual quote Vreeland found in a letter or diary. One wonders what Renoir would think of the modern marketing of art. What makes the novel live and breathe are the portraits Vreeland paints with words of the models themselves and how they interact with each other, and, most of all, how their affection for Renoir and his for them produces the magical chemistry that you can see in the painting. A thousand little brushstrokes coalesce to give an unforgettable impression of a joyous afternoon. It looks like the sort of party to which we’d all like to be invited. Thanks to Renoir we can at least imagine ourselves there. And thanks to Vreeland, we know the names of all the guests.